“Seven Days in May” is both a Constitutional and a conversational thriller. Its opening credits, after all, are superimposed over images of the Constitution, immediately cluing us into the fact that nothing short of the supreme law of the United States of America is at stake. That’s because a coup d’etat has been set in motion in the upper echelons of the military to wrest power away from the President, a plot that one man helpfully detects though he is not initially believed by the President’s top advisors. That seems like a storyline designed to bolster conspiracy theorists, but really this attempt at overthrow is just an excuse to re-underline our American values. Not that Frankenheimer is content to merely dabble in jingoism. This is a tense, eminently watchable thriller, made so not through any sort of traditional action but through chit-chat, though even then, ultimately, that chit-chat is no match for what one character does. 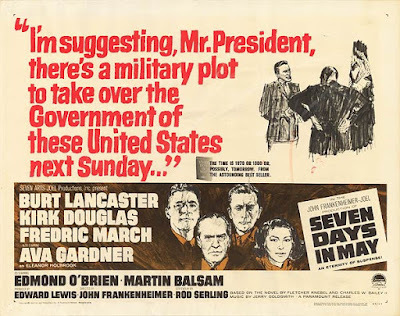 As the movie opens, President Jordan Lyman (Fredric March) has signed a nuclear disarmament treaty with the Soviet Union, causing his approval rating to plummet to a ghastly 29%. He learns this while being warned by the White House doctor about his stroke-level blood pressure, which POTUS shrugs off by citing the weight of the free world. And while that might be a plot point that another movie would loop back around to near the end, here it is just character building. In the aftermath, he goes for a swim rather than the two week vacation the doctor prescribes, though the movie doesn’t even let us see one stroke of this swim, just cutting to him after he’s exited the pool and is already in the midst of another politically charged conversation. The movie waits for no talking. It is talking that is either tense or faux cordial, where jokes and pleasantries exchanged (sort of) mask the governmental tension running underneath, though occasionally the movie pauses for a big speech. No speech is better than the one President Lyman gives before a flag bearing the nation’s motto, E Pluribus Unum, which he delivers by looking to the heavens, not pleading to constituents for votes but begging on behalf of the American people for justice for all. 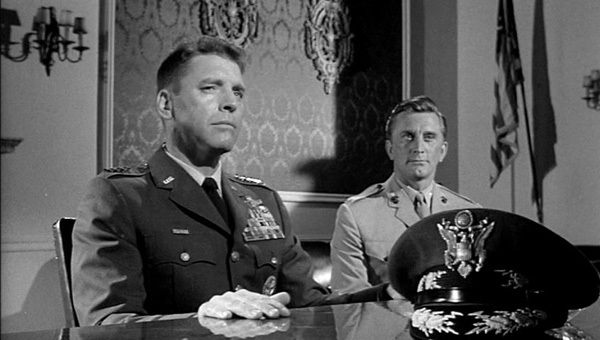 The plot behind Lyman’s back is engineered by the Chairman of the Joint Chiefs, General James Mattoon Scott (Burt Lancaster), who not only naturally disagrees with the just-signed treaty, but envisions it engendering the end of the United States when the Soviet Union no doubt refuses to live up to its end of the bargain. That’s why Scott needs to seize control, and Lancaster plays the part as if John Wayne was asked to re-interpret Col. Bat Guano, giving derangement such as patriotic gleam that you can understand why so many would go along rather than cower. And while the movie initially plays coy about Scott is up to, it does not take long for the dots to start connecting, for us as well as for Colonel Jiggs Casey (Kirk Douglas), the director of the Joint Chiefs. He might lionize Scott, but as soon as Jiggs sniffs out what’s happening he goes straight to his Commander in Chief. In the company of a couple more of the President’s confidants, the men devise a plan to ward of Scott’s intended ambush, not all of which is any less un-virtuous than the Chairman’s proposed methods. Indeed, if most of the conversations here involve men, the couple notable exceptions involve men essentially working women for information, like a drunken old Georgia senator getting a woman in a New Mexico bar to gossip about the secret army base he is trying to find. Then there is Eleanor Holbrook (Ava Gardner), the mistress of Scott, a character that, in the end, is essentially superfluous, though her existence demonstrates the nastiness of Beltway politics when the President enlists Jiggs to press her for blackmail material on the Joint Chiefs Chairman just in case. She’s barely a person. Still, Gardner’s introduction is worthy of the Movie Star she was, lounging in a wingback chair at some political insiders cocktail party If the character is barely allowed to a person that still sort of winds up feeling just right, as Gardner drifts through the movie, tumbler in hand, as the personification of the ghosts of those the political machine chews up and spits out. Jigg’s seduction, more or less, of Eleanor is the one moment undercutting his otherwise impressive nobility. That might have been on purpose, though I suspect it is simply a sign of those times, though either way it fuzzes up his character a bit. In either event, Jigg’s nobility is born not so much of verbiage but of action. When he speaks, it is more often jokes made to ward off sensitive inquiries, or deliberate refusals to make partisan political statements. No, he is the one character whose motivation remains strictly interior, as if to him, all the conversation is just white noise compared to the words of the Constitution.